From Cairns to Coeur d’Alene I quickly settled into Coeur d ‘Alene life courtesy of a very hospitable local, Curt DuPuis. It’s always a shock to the system when I’m away from my family. Time restraints and fatigue are no longer a major factor and professional athlete life suddenly feels very easy. I don’t think it’s coincidence that I have my peak races often after some time away for a brief training camp. The downside, is I’m generally miserable and miss them like crazy and have a two week max limit of time away solo. I’m incredibly grateful to Monica who is very aware of how hard I find it and has compromised her career year after year to join me for my annual U.S pilgrimage. 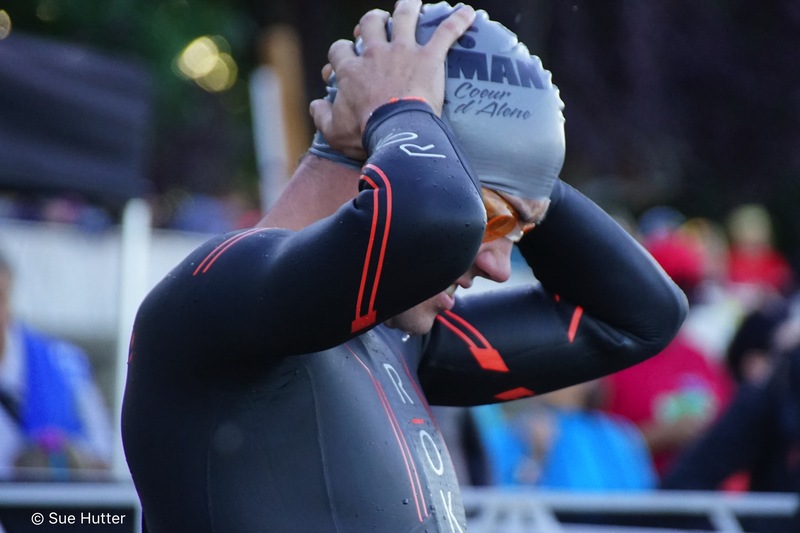 Ironman 70.3 CDA is a tough, fair and beautiful event that is really well supported by the local community. One of those rare events where in the middle of the race you find yourself already deciding that you’re coming back the next year. Andy Potts was the defending champ and the guy I was most worried about for obvious reasons to those that know the sport. After some time off post Ironman Australia it’s been nice to go back to pure middle distance training and see the speed and threshold work pay dividends in gradual training improvements. In the past, Andy climbs really well on long gradual sustained climbs where as I always felt I had the edge on the long sustained descents. So the plan was to bridge the gap to Andy after the swim. Be relatively conservative with the long sustained climb. Attack at the far turn around for the long sustained descents. Then run fast. The plan kicked off perfectly. I started next to Christian Kemp because I felt he was the strongest ‘swim starter’ in the field. Kempy is one of the more talented guys in the sport but has had a career often held back by injury. I guessed right on his swim start speed and 300m in and Kempy was clear of the field with me drafting in his wake and gasping for air at the intensity. Andy soon joined us, moved past me and gradually took the lead. I hung with these guys until about 500m to go exiting 22 seconds in arrears. A solid swim. On the bike I closed the gap quickly to the lead pair. Once I got to Andy and Kempy, their speed dropped. I shared the lead with Andy for a while at a conservative effort. The thought being that it’s a tough ride, plenty of time for shenanigans later. Enter Matt Hanson. 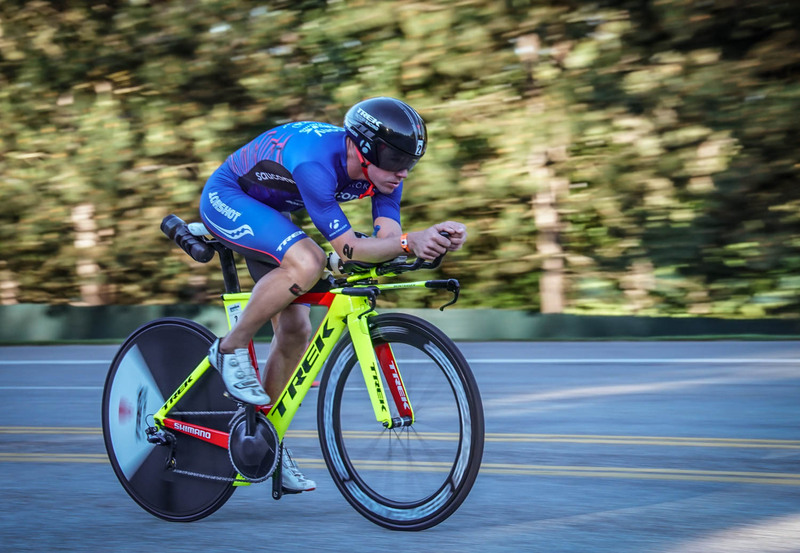 It’s not that I didn’t respect Matt as an athlete, he’s a beautiful runner with a terrific record in Ironman for such a relatively short career. 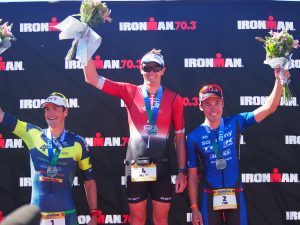 His recent win at the U.S Ironman championships was all class, catching a very tight knit lead group and eventually riding clear of them followed by an incredible marathon. Given the swim prowess of Andy Potts and Kempy, I expected Matt to be further back in the swim and that we had more time. Matt made up his swim deficit quite quickly, catching us 40 minutes into the ride. As soon as I saw he was about to catch our trio, I bumped my power up a lot. My thought being that Matt would have been hoping to recover from his big effort to get to the front and so it was an opportune time to not allow him to recover. Matt surprised me and did the opposite to what I expected. After about 5 minutes he road to the front. Post race he confessed that it was simply to slow the pace back down and get things under control so he could get back to his game plan. A clever move that caught me off guard. I went back to my game plan of waiting until the far turn to make my move. Unfortunately Matt had exactly the same idea. After watching him complete possibly the widest U-turn possible that only a bloke from Iowa who sits on their indoor trainer 90% of the cycling time could complete, he took off. I waited for Matt to be well clear then bridged the gap to Matt however it took it’s toll as Matt was a man on a mission. We swapped the lead several times and had margin of breathing room to the other guys. My major concern now was what to do with Matt. He regularly runs the fastest split in races and knowing where my running is at currently, I was a little nervous. I didn’t have too much time to contemplate my conundrum as on the final uphill approximately 10 minutes from transition, Matt made another move and pushed to a 45 second margin by T2. Onto the run and my spirits lifted. 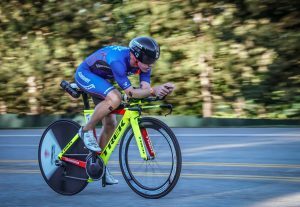 I felt good off the bike for the first time in a while, I didn’t have to wait for my back to loosen up before I could really push thanks to my new position on the bike. After 5kms Matt and I were still 50 seconds apart, with no real time change since T2. I figured that now was the time to really try and push as Matt would surely be paying the price for his hard ride. For the next 5kms I pushed, confident I was moving well and I I would bring back at least a little time. Instead I got a split that Matt was now 80 seconds up. That hurt. The splits kept growing as Matt went on to run a 1.11 on a run course with a lot of false flats and turns. I held for 2nd, Andy 3rd and Kempy 4th. Of course, there is no feeling like winning but objectively, I was quite pleased with the numbers for a tough course. We’ve resolved my back pain and I feel I’m in a much stronger and aero position on the bike. Things are on track for a September/October peak. Big shout out to all the Coeur dAlenians.. especially Curt Du Puis (again) and Sue Hutter. Just got to Boulder, Colorado which is heaven for chronic exercisers. A few weeks until Ironman 70.3 Racine in Wisconsin.